One reason that vinyl windows are so popular is that they require very little maintenance. They aren't like wood windows that will warp in the hot summer sun or that will rot when exposed to rain and snow over time. You don't have to seal the frame to keep it protected from the elements, and you don't have to keep painting the frame to keep the window looking good. Cleaning your vinyl windows will maintain their beautiful look. All you have to do is clean the glass with a mild cleanser. Don't use an abrasive or oil-based cleanser, as these can strip coatings that protect the window's energy efficiency. Clean the tracks as well as the glass. Keeping the tracks free of dirt and debris will ensure that the windows open and close with ease. Again, you need only use a soft cloth and a mild cleanser. Vinyl window frames won't peel or crack, but they can start to fade a bit in the hot sun over time. You can keep the frames looking nice by buffing them periodically. Just use a soft cloth to wipe down and lightly polish the frames inside and out. You don't need to use a specialty cleaner or sealer. However, if you find some dirt or debris on the frames, you can use a mild cleanser to clean it off. Over time, the seal around the glass or the frames of your vinyl windows can degrade, allowing air to escape and making your windows less energy-efficient. Check the seals periodically, including the caulking along the frame and the glazing along the windows, and replace them as necessary. Check these seals at least twice a year -- before the summer begins and then before winter begins. 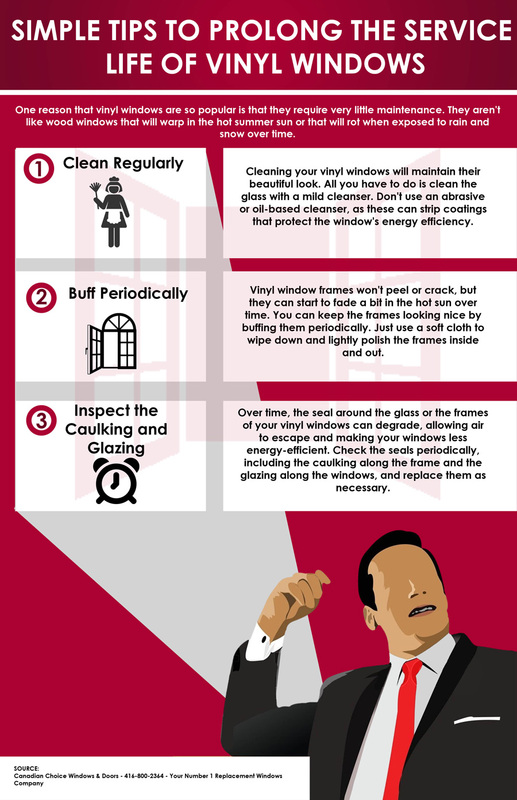 If you are ready for window replacement, Markham residents trust Canadian Choice Windows. Click here to get windows replacement quotes in Markham. We have some of the best rates in the city, and we have a wide selection of high-quality vinyl windows. Call the windows company Markham residents love. Call Canadian Choice Windows.